One of the most common Warwick Bros. & Rutter backs, with a Calgary hotel’s stencilled label. Warwick Brothers & Rutter, Ltd., a Toronto-based printing company, is known to have published in the vicinity of 7,500 picture postcards between 1903 and 1912. 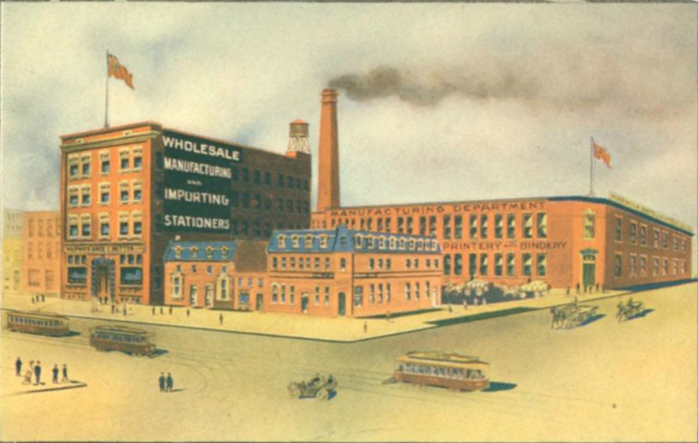 Warwick produced colour lithographed cards on its own presses in Canada rather than outsourcing that work to printers in Germany or England, as was then the prevailing practice among its Canadian competitors (and among postcard publishers in most other countries as well). 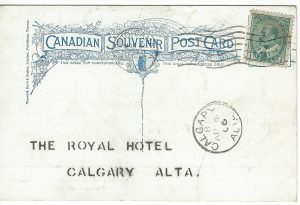 The company’s entry into the postcard business was made more difficult by the fact that, after less than a year of production, the company’s premises at 68-70 Front Street West were destroyed in the Toronto fire of 1904. The company suffered over $200,000 in losses. According to a report carried in The Wetaskiwin Times, the Warwick establishment must have been on the edge of the fire damage, as it was noted that “only the space intervening between Warwick Bros. & Rutter’s big warehouse and the Queens Hotel saved the latter from destruction”. Fortunately for Warwick, many of its products had already been sent out “on the road” with its salesmen in anticipation of the spring season. However, virtually all of its postcard inventory was lost — save for an order of co-branded cards from the Raphael Tuck company in London that had been in transit from England and arrived directly after the fire. Because Warwick Bros. & Rutter had been printing postcards for only a few months prior to the fire, the surviving pre-fire cards are of particular interest. 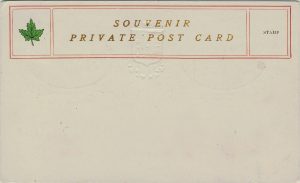 Many of them (if not all) are distinguishable in virtue of being about a centimetre wider than a standard postcard (the excess width was frequently trimmed by postcard enthusiasts eager to fit the cards into albums designed only for the standard size). An example of a Warwick postcard “back” that is typical of this early period is shown later in this post. An article published in the trade journal Bookseller & Stationer noted that, within days of the fire, Warwick Bros. & Rutter were busy re-creating the printing plates that had been lost. As a result, the collector will find pre- and post-fire designs on certain Warwick postcards that are very similar but — on close examination — not quite identical. 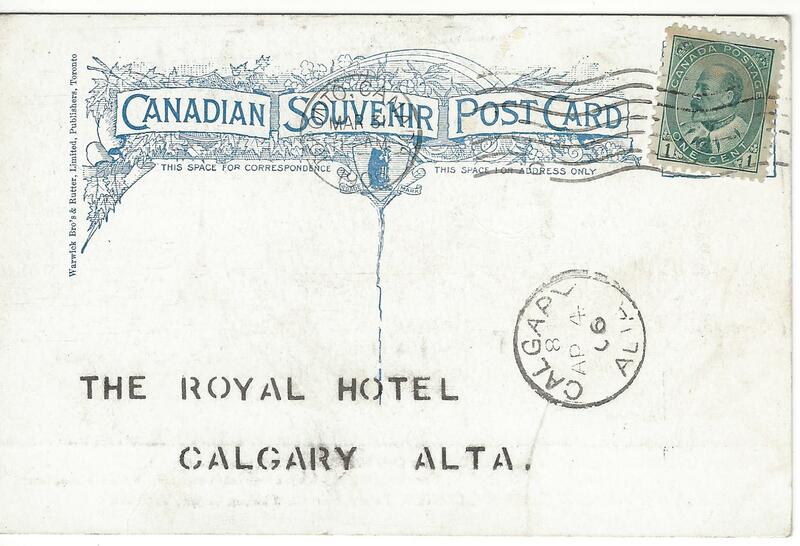 In any event, within about three months of the fire — in the summer of 1904 — we begin to see the first “new” postcards by Warwick Bros. & Rutter (using the postmark dates for reference). While there were a few exceptions, the postcards produced after the fire were generally of the standard size. These postcards included many interesting and creative series and designs that continue to be sought after by Canadian collectors. They would have been produced at the company’s new purpose-built plant, which replaced a former coal yard at 401-405 King Street West, just west of Spadina Avenue. The artist’s rendering of the new establishment that is shown later in this post was featured in the company’s advertisements for a number of years. At the right of the image, the neighbouring industrial building at 82-94 Spadina Avenue is also emblazoned with the “Warwick Bros. & Rutter” name. This second building was actually the premises of another well-known printer-publisher (and postcard manufacturer), W. J. Gage & Co., which had been a neighbour of Warwick’s at 54-58 Front Street and was also left homeless after the 1904 fire. It may be that Warwick initially planned to build and occupy two buildings and later sold or leased the second of them to Gage (while retaining the impressive, if misleading, image of the “complex” on its promotional materials). 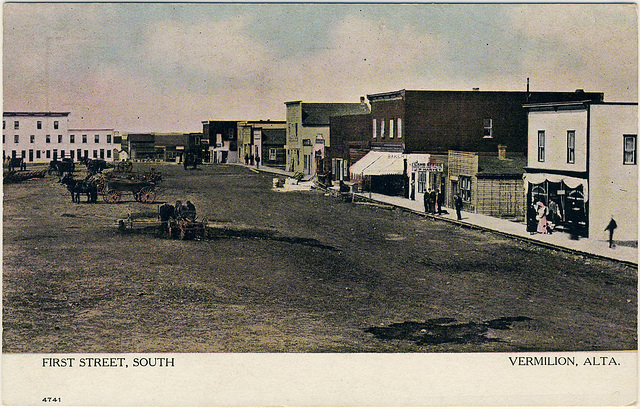 First Street, South – Vermilion, Alta. (4741) illustrates the most characteristic style of Warwick Bros. & Rutter’s postcards. The colour palette of Warwick lithographs tends to be muted in comparison with some rival manufacturers. 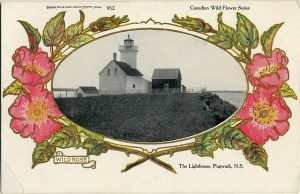 The Lighthouse, Pugwash, N.S. (952) Warwick Bros. & Rutter published many “special” series. 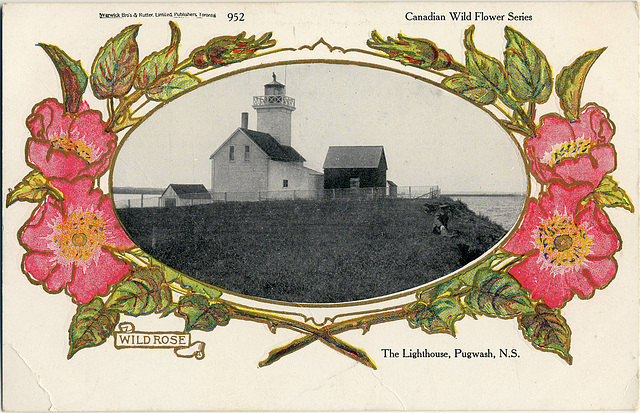 The “Canadian Wild Flower Series”, of which the Pugwash card is an attractive example, featured half-tone images inlaid within a pre-printed surround of one of three flowers: wild rose, purple aster and golden rod. Incidentally, the neighbourhood was also home to the Toronto Lithographing Co., another significant postcard manufacturer, which had established itself at 459-467 King Street West well before the 1904 fire. Note that Toronto street numbering was revised after this period and that the addresses on King Street do not correspond to those in use today. For its part, 82-94 Spadina is now known as 80 Spadina — while this blog post does associate the building’s early history with W.J. Gage & Co., it also states that the current structure (which looks much larger than the one in the illustration) was built in 1928. Warwick’s post-fire premises at 401-405 King St. W. at left, with the W. J. Gage factory at 82-94 Spadina Ave. at right. The illustration shows the Gage building with a Warwick Bros. & Rutter sign. Alaska (pre-statehood) -2; U.S.A. (Rochester?) – 1; Bermuda – 2; Mexico – 5. The founder of the business that became Warwick Bros. & Rutter was William Warwick Jr. (1833-1880). Warwick was born in Montreal on June 3, 1833, the son of a senior William Warwick (c 1788-1837), who was himself one of three brothers who were brass and iron founders in Montreal. Warwick’s mother, much younger than his father, was the former Alice Chisholm (1814-1890). The Warwick family were members of Christ Church Cathedral in Montreal and many references to them appear in the records of that church. Undivided back characteristic of many of Warwick Bros. & Rutter’s earliest postcards. At some point after the death of William Sr. in 1837, his widow Alice relocated the family to Toronto. In 1848, William Warwick Jr. began to operate a small book and stationery shop in Woodstock, Ontario. 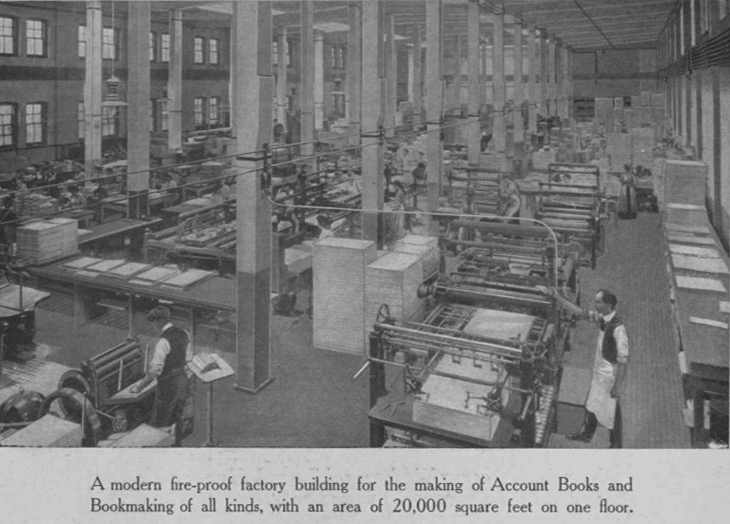 In the 1850s he added a bookbinding facility and began to manufacture and publish schoolbooks and other types of books (mostly likely including blank ledgers and account books for businesses). In the 1860s he developed his wholesale business, but he found Woodstock to be a limited market and moved his business to Toronto in 1868. His life ended tragically at the age of 47. While driving through the Exhibition grounds in Toronto, Warwick was thrown from his carriage and injured so severely that he died within a few weeks, on September 20, 1880. The loss of the head of the business was a serious blow. But Warwick had surrounded himself with able and loyal associates who were able to take up where he left off. His widow Rosina (1831-1899), who had proven herself a worthy and capable assistant to her husband, became the head of the business. She was assisted by her eldest son, Guy Frederick Warwick (c 1856-1919) and by Arthur Frederick Rutter (1856-1938), who had joined the staff in 1873 and was put in charge of the manufacturing departments. This advertisement showing off Warwick Bros. & Rutter’s new King Street quarters makes sure to note that the company’s new building is fire-proof! Following William Warwick’s death, the name of the business was changed to “Wm. Warwick & Son”, with Rosina Warwick and Guy Warwick as the firm’s principals. In 1885, when the second son, George Robinson Warwick (1863-1956) was admitted to the partnership, Mrs. Warwick retired and the firm name became “Warwick & Sons”. Arthur Rutter was taken into the partnership in 1886 and Charles Ernest Warwick (1866-1920), the youngest son of William and Rosina, was also made a member of the firm. As a result of these changes, the firm name was changed in 1893 from “Warwick & Sons” to “Warwick Bros. & Rutter”. Between 1903 and 1912, the production of picture postcards was a significant sideline for Warwick Bros. & Rutter. As mentioned above, Warwick was the first Canadian firm to enter the field with Canadian-made coloured cards, leading the way in three-colour and four-colour printing processes and making available the highest class of color printing at a popular price. 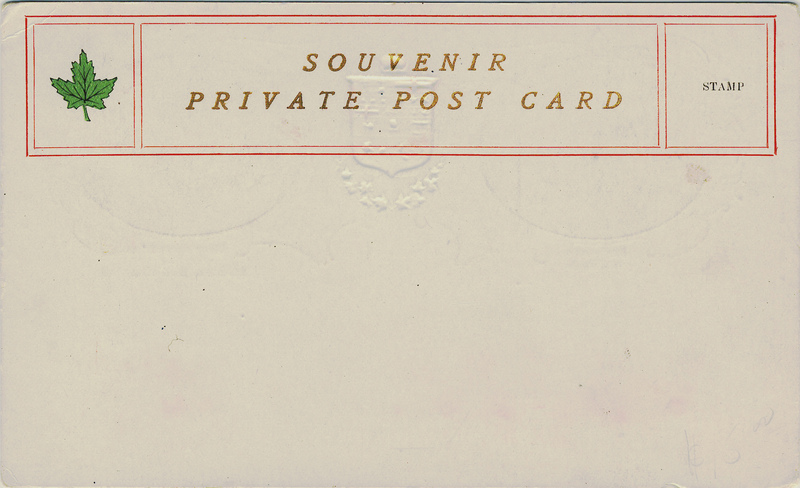 It should be noted in closing that the company had many other product lines that were far more significant to it than postcards and that it continued in business until the early 1970s. The most comprehensive listing ever made of Warwick Bros. & Rutter postcards is Michael J. Smith, The Warwick Bros. & Rutter Picture Postcard Handbook 1903-1912 (2007), which is currently out of print but occasionally obtainable from used book dealers or on eBay. NEW!! We’re pleased to announce that a list of about 7,000 WB&R postcards has been added to our “Checklist” page. See it here. (July 21, 2018) Please help us by reporting any errors or omissions that you find. Error: Error validating access token: Session has expired on Friday, 12-Apr-19 20:21:58 PDT. The current time is Friday, 19-Apr-19 21:22:42 PDT.